NORTON, Va. – When Dr. Addison Ward was 5 years old, he accompanied his mother, a nurse, to a medical conference. There, he heard a cardiologist speak and watched a video presentation of a heart bypass procedure. From that moment, he knew he wanted to become a physician. 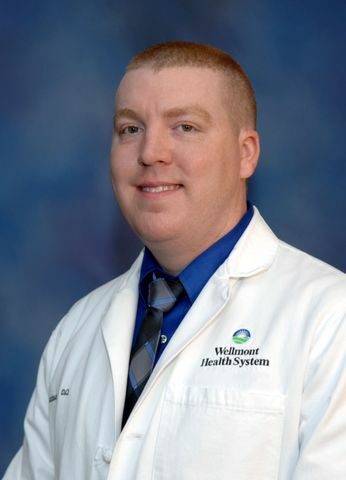 Now, after graduating from the family medicine residency program created by Wellmont Health System in Southwest Virginia, Dr. Ward is joining Wellmont Medical Associates in Norton Commons. He will begin seeing patients Thursday, Aug. 1. Dr. Ward, a Virginia native, graduated from Virginia Tech and the Edward Via Virginia College of Osteopathic Medicine before entering the osteopathic family medicine residency program. As part of the program, Dr. Ward saw patients at Mountain View Regional Medical Center, Lonesome Pine Hospital and Lee Regional Medical Center and received some of his specialty rotation training at Holston Valley Medical Center and Bristol Regional Medical Center. He is particularly interested in helping his patients prevent heart disease, the No. 1 cause of death in the United States. That dovetails with his overall desire to promote health maintenance and disease prevention. Dr. Ward and two other physicians graduated from the residency program this summer. He is the second graduate to join Wellmont Medical Associates, with Dr. Aaron Porter, the first, also practicing in Norton. Like Dr. Ward, Dr. Porter is an osteopathic physician. “The goal of the program was to create better physician access in rural areas such as Southwest Virginia by educating physicians right here where they’re needed most,” said David Brash, Wellmont’s senior vice president of business development and rural strategy. Another person who is thrilled with the start of Dr. Ward’s practice is Dr. Maurice Nida, Wellmont’s director of osteopathic graduate medical education, who is intimately involved in the residency program. He said Dr. Ward will use his abundant talent to offer medical expertise and compassionate care to the residents of Wise County and surrounding communities. Dr. Stephen Combs, a doctor of medicine and chief executive medical officer of Wellmont Medical Associates, said the addition of Dr. Ward is another example that high-quality primary care is available close to home in Southwest Virginia. Dr. Ward’s office is located in Norton Commons, 601 Commonwealth Drive. He is accepting new patients and many types of insurance plans. To schedule an appointment, please call 276-679-5880. Download photo of Dr. Ward.